When Americans visit Moscow, they want both a taste of home and things that seem slightly exotic. Shawn McKenna brought American-style dining to Russia’s capital. He and other American expatriates share their favorite Moscow places. Moscow’s first American diner was shipped to Russia in parts, much like a recycled amusement park ride. Muscovites lining up in the snow outside the Tchaikovsky Concert Hall noticed one day that a diner was appearing piece by piece, like a stamped-tin and chrome Lego fortress, right in the heart of Moscow. Related: Are Russian restaurants competitive? Suddenly, business deals were being consummated over French fries and ketchup. 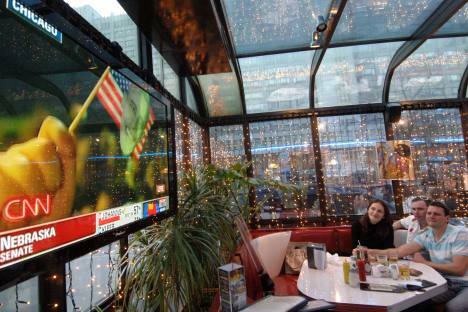 As expatriate families arrived in Moscow, the restaurant became their first stop after Red Square. Those were heady days for international relations between the West and Russia, and American expats were streaming in — from brigades of consultants and businessmen, to herds of journalists and academics, as well as missionaries, students, poets and dreamers. Moscow attracted adventurous people who were taken by its energy. Shawn McKenna, one of the founders of Starlite Diner and other restaurants in Moscow, was among the first of these pioneers, and also among the longest lasting. “I like the vibe and trendiness of the city, the economic development of the entire population, and that it is a melting pot of different nations and regional cultures of Russia,” McKenna said. By the mid-1990s, he had started his own restaurant business, bringing the classic diner experience to Moscow. Initially, 95 percent of his clientele was made up of expatriates. Today, Starlite Diner serves authentic burgers and milkshakes to mostly Russian customers.